Submitted by dave on May 9, 2007 - 3:00pm. Two “Crooks” Fight With Pistols in a Small Room – Both Killed. DENVER, Aug. 2. 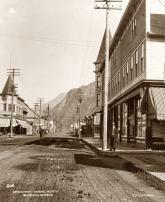 – A duel between two “crooks,” F. H. Edgar of Salt Lake City, and Harry Duff, supposed to be “Billy” O’Brien of San Francisco, in a small room in a hotel on the corner of Curtis and Fifteenth Streets this afternoon, at 3 o’clock, resulted in the death of both men. The duelists and a fellow called George Sheldon, who is believed to be James Cullen, recently released from the Utah Penitentiary, came here a week ago from Salt Lake City, where they had been “working” the visitors to the Pioneers’ Jubilee. Submitted by dave on May 4, 2007 - 2:53pm. 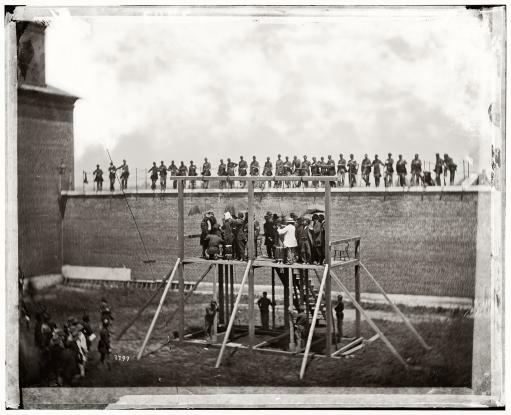 The four condemned Lincoln assassination conspirators (Mrs. Surratt, Payne, Herold, Atzerodt) with officers and others on the scaffold at Fort McNair. July 7, 1865. Photo by Alexander Gardner. View full size. Submitted by dave on May 4, 2007 - 2:52pm. 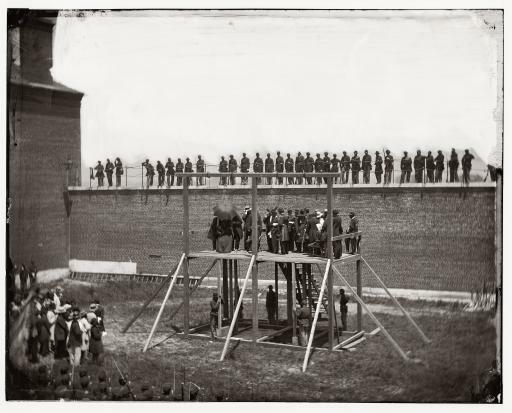 Lincoln assassination conspirators. Adjusting the ropes for hanging the condemned at Fort McNair. July 7, 1865. From left, Mary Surratt, Lewis Powell, David Herold and George Atzerodt. Photo by Alexander Gardner. View full size.